Whether you are in town for a local convention event or vacation you can get through San Antonio International Airport easier with our maps giving you an overview of the airport. Home to the battlefield of Texas’ independence, San Antonio is a great place to find yourself, whether it’s for an extended stay or a brief moment. San Antonio International Airport is a small, but busy facility that shows the city’s soul, inside and out. Enjoy local Tex-Mex alongside a renowned kindness that feels so right it could bring the world together. 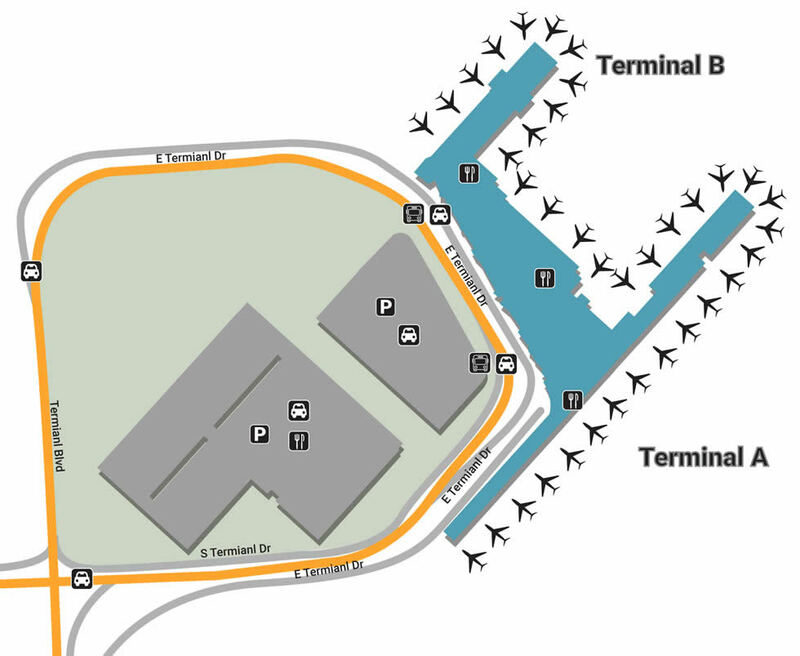 The closest lot to both Terminals A & B is the Long Term Garage located on South Terminal Drive. If you’re looking for daily/hourly parking that’s also cheap, head to the Green Lot, located off the corner of Dee Howard Way and Airport Boulevard. Overflow parking can be found at the Red Lot, which is located at the end of Northern Blvd. For those popping in-and-out, head to the Cell Phone Lot for free parking, located off the corner of Northern Boulevard and Airport Boulevard. SAT is synonymous with love and kindness, something that goes a long way in stressful times. Instead of looking down, peer up to the heavens for astonishing art, whether it be the magnificent ‘Suitcase Wheel’ by Terminal B or the stained-glass colors that light up the Paseo Walkway. The airport is also filled with local ambassadors aimed at making every nationality, religion, or creed feel welcome. As a token of appreciation for soldiers, the airport is home to an expansive USO facility that gives military families the intimacy they deserve. Enjoy what’s around you while you wait, whether it’s Stars of San Antonio (Gate A8), a local boutique that brings the color out in everyone’s eye, or UETA Duty Free (A6), a luxurious gift shop that offers upscale tobacco, quality cosmetics and daily discounts that make it all worthwhile. Keep up with the happenings of the world by sticking to the headlines of San Antonio Express-News (A13, B3), or enjoy the regional editorials of Texas Monthly News, located beside the ticket lobby. Satisfy dormant cravings before waking up to a new day by enjoying the local and international cuisine at either of SAT’s food courts. Have a local delicacy by visiting Fruteria (A3), home to fresh cocktails and tapas that offer Mexico’s brightest tastes. If you’re in the mood for street tacos, order a round at La Gloria (A7), or walk next-door to enjoy Mediterranean at La Tapenade. If you’re in the mood to try out some local near Terminal B, stop by Rosario’s for upscale Mexican at a price anyone can afford.